Homemade Tzatziki Sauce is not only crazy delicious, but is super easy to make! It is perfect for an appetizer, dip, or condiment to serve with your favorite Mediterranean dishes. 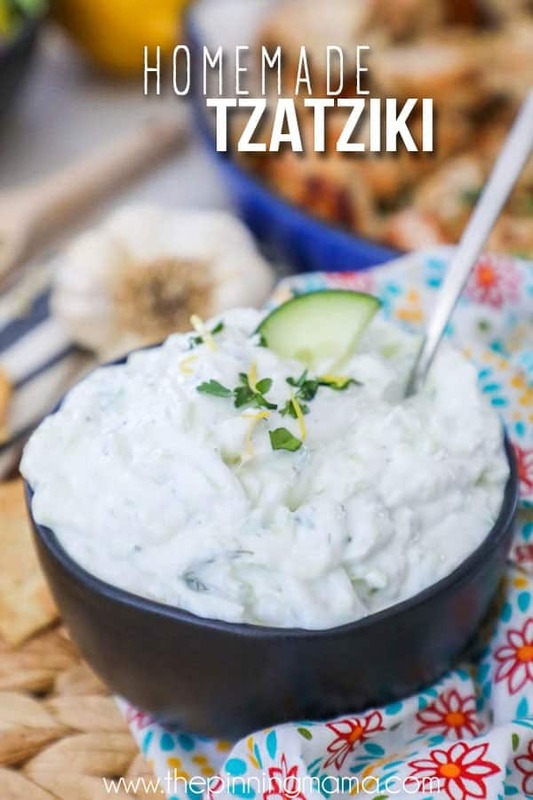 This recipe shows you how to make this tasty yogurt spread from scratch and get all the delicious flavors of cool cucumber, zesty garlic, and fresh dill that you love in Tzatziki. Serve it with classics like gyros, Greek salad, and chicken pitas, or get creative with some of the suggestions, below. Either way, you will love this recipe for it’s combo of ease in making and delicious flavor! I didn’t grow up eating Tzatziki sauce, or really anything more exotic than Tex-mex (which isn’t actually exotic when you grow up in Texas, ha!) But over the years I have been thankful to stretch my rather limited and somewhat picky palate into cuisines from many different regions and ethnicities. I will straight up tell you that I don’t love all of them, but some of them I don’t know how I spent my life without! Mediterranean food and Tzatziki especially, definitely fall into that category and Tzatziki sauce has pretty much gotten to the point where it is just a staple in my fridge. I wanted to share this recipe with you today so if you haven’t had it, you can hopefully fall in love with it like I did, and if you have had it, but have never made it from scratch, you can learn how crazy easy it is to make and keep on hand. Suggestions on how to serve tzatziki sauce, both appetizer and main dish recipes! If you love these flavors as much as I do, make sure and check out some of my other recipes like this one dish Mediterranean Chicken, and this crock pot easy Greek chicken. Tzatziki is a traditional greek sauce made from yogurt, cucumber, and garlic. It can be used as a condiment or appetizer, is usually served as a sauce for Mediterranean dishes or as a dip. Since Tzatziki sauce is generally healthy, it is a great way to add a lot of flavor to a dish without adding a lot of calories or fat. We use Tzatziki sauce often both for topping main dishes on lunch or dinner entrees or as a dip, or part of an appetizer. I am going to share a few of my favorite ways to use it for each course with you below. Tzatziki Dip– Simply put the bowl of tzatziki out with a platter of veggies such as, carrots, celery, sweet bell peppers, cucumbers, tomatoes, etc. as well as, pita chips or pita triangles. This also works well paired with hummus. Greek Nachos– Layer pita chips with dollops of homemade tzatziki sauce and hummus. Then sprinkle the top with your choice feta cheese, diced tomatoes, kalamata olives, cucumbers, and sweet peppers, and pepperoncinis. Serve immediately. Greek Pinwheels– Spread tzatziki on a large tortilla or flatbread. Place thinly sliced turkey on top. Sprinkle evenly with feta cheese, pepperoncini slices, and kalamata olive slices then roll up tightly and cut into 1″ slices. Greek Chicken Bites– These are a go to at our house since they are quick, easy, healthy, and delicious for kids and adults. As a matter of fact, I sometimes refer to these as grown up chicken nuggets. 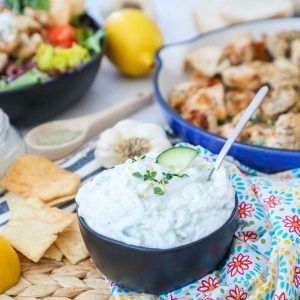 Use this homemade Tzatziki sauce recipe as the perfect (and healthy) dip for these tender and flavorful chicken bites. Chicken Wraps– When we lived in Rhode Island there was a little place that made the MOST phenomenal Mediterranean wraps. I used to stop there regularly and often shared it on my Instagram, but now frequently make my own copycat of these since we are far away. Start with flatbread, layer hummus, tzatziki sauce, chili sauce (if you want a kick) chicken (I use the greek chicken above) lettuce, tomato, cucumber slices, and pepperoncini. Roll it up. Kebabs– Start of the grill and put some greek chicken or lamb kebabs on. Then use this homemade tzatziki to dip them in as you eat. Gyros– You can make traditional gyros, or chicken gyros using the chicken bites above. Greek Salad– I love a big salad loaded with all of the greek fixings, like feta, kalamata olives, pepperoncinis, and chicken or lamb. You can use a traditional Greek dressing, or to change it up, use tzatziki sauce as your dressing instead! Hummus bowl– In my travels to NYC, I often stop at a little place in Urbanspace Vanderbilt and grab a hummus bowl. This power lunch is easily recreated at home by putting a layer of hummus on the bottom of a bowl, topping with your choice of chopped veggies and meat, then a scoop of tzatziki sauce to top it off. Use pita bread or a fork to dig in and eat all that goodness in the bowl. Trim the meat and make desired cuts. Place 1 cup of tzatziki sauce in a dish or zip top bag and then add the meat. Massage the tzatziki into the meat until all of the meat is completely covered. Chill and let marinate for 2 hours- overnight. These are just a few of the endless options you can use this versatile sauce for. If you have another great way you love to serve Tzatziki sauce, please leave me a note in the comments and let me know! I would love to give it a try soon! This Homemade Tzatziki sauce recipe is amazingly simple to make and has become a staple in my fridge. Make sure to scroll to the bottom of this post for the full recipe. Here I am going to give you some of my tips and tricks for this recipe so that it will hopefully answer any questions that come up while making this recipe. If something else arises though, leave me a note in the comments and I will try to get back to you! Q: Do I have to grate the cucumber to make tzatziki sauce? A: I call for grated cucumber in the recipe since I think that is the way it works best. If you really don’t want to grate the cucumber you can also finely dice the cucumber and use it in the sauce instead. I prefer grated because I think it melds the flavors best and allows you to get the perfect amount of cucumber distributed in each bite. Q: Can I use jarred, dried, bottled etc instead of fresh? A: Similar to the answer above, although you can do it, I highly suggest fresh garlic, lemon juice and dill because it will really effect how the taste of the tzatziki sauce comes out. Each of these are easy to prep and so it isn’t a huge time saver to use pre-packaged over just going with fresh. Dill is probably the least readily available as lemon and garlic should be available everywhere. I usually find my fresh dill in the produce section packaged with the herbs or near the lettuce. Q: Can I use sour cream in the tzatziki? A: Some recipes will use a 1:1 ratio of sour cream to greek yogurt in their Tzatziki recipes. I have found that this will add a bit of richness to the sauce, but while delicious both ways, I tend to prefer to keep it simple (and still very healthy and delicious) and just use greek yogurt in my recipe. If you want to use sour cream, you can use 1 cup of each greek yogurt, and sour cream, instead of 2 cups of greek yogurt. You might have some of this delicious homemade Tzatziki sauce after you serve it. And if you do, you are in luck! This stuff just keeps getting better the next day as the flavors further marry and just become even more delicious. If you have leftovers, you can store them in an airtight container in the refrigerator for up to 3-4 days. Make sure to give it a good stir before serving as the cucumbers will continue to give off moisture and will need to be recombined. I sure hope that you get a chance to make this homemade Tzatziki sauce recipe and enjoy as much as we do! You might find a new way (or ten!) to use it too! This homemade Tzatziki Sauce is can be used as an appetizer, dip, or condiment. It is perfect for dolloping on top of your favorite Mediterranean dishes like gyros, pitas, greek nachos, etc, and is just as great set out in a bowl to dip pita chips or veggies in. Grate the cucumber using a box grater or the grating attachment of a food processor. Save the grated cucumber and discard any excess juice. Mix all ingredients together until they are well combined. Chill in the refrigerator for 2 hours to allow the flavors to meld. Serve chilled as a dip or condiment.